The Return Of Ronnie Coleman? Is the man many consider the greatest champion in bodybuilding history making a historic comeback? Ronnie Coleman held the Mr. Olympia title 8 times; tied for the most of all time. He claimed victory in the IFBB 26 times; the most of any bodybuilder, ever. Many consider him the Michael Jordan of bodybuilding. 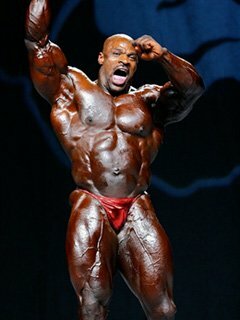 When Ronnie Coleman stepped offstage for the last time in the fall of 2007 at the Olympia, it was the end of an era of dominance that we may never see equalled again. But like the end of many great athletes' runs, many have speculated whether Ronnie will come back. Each year since his 4th place finish at the '07 Olympia, there have been rumors that he was coming back. The King would return to claim his throne. It's understandable, because even though he has not competed since, Ronnie has been as close to the sport as ever. Whether it was his guest-posing around the world, his appearances at all the major expos, his contributions most recently to Muscular Development Magazine, working on plans for the "Ronnie Coleman Signature Series" line of supplement products, or using his celebrity status to give back via his charity "Free the World From Hunger," Coleman maintained his position as an ambassador and representative of bodybuilding. He knows that bodybuilding gave him so much and he wants to give back as much as he can. Is 2011 The Year It Happens? Those rumors have never been stronger than this year when Dan Solomon, Chad Nicholls and Lee Thompson brought the subject up on Pro Bodybuilding Weekly. They announced that both Brian Dobson, owner of the world renowned Metroflex gym in Arlington, Texas, where Ronnie trains, and the promoter of the IFBB Masters World Championships in Miami announced that this was the year Coleman was coming back. So is it true? Will the man many consider the best ever make a triumphant return and prove that even as he enters his late 40s he still has what it takes to stand among the best? Bodybuilding.com chatted with the legend to find out the latest on what could be history in the making. You haven't been on stage since the '07 Olympia but rumors have been circulating for a long time that you were going to come back at some point. Did you think that was the last time you competed or did you know that you would make a comeback? I always knew that I would make a comeback at some point. I didn't know when but I knew it would eventually happen. Is this the year we will see you back in a pair of posing trunks? Well to be honest I don't know if I am going to now or not. I knew I would comeback at some point because I want to prove to myself that I can still do it. If I do this it will be for me to prove to myself that I can still get on stage and bring a winning physique. What is going to help you make the decision to return to an IFBB stage this year? I don't know how well-known it is, but I had back surgery in '07 and it took about two years to recover. I just recently felt comfortable enough to do it. It is different for me to prepare now because back when I competed I didn't travel or anything. I prepared and that was it. After this surgery, for a while I didn't even leave the house. I have a gym at home so if I felt good enough to work out I did it there. I am feeling good now but it's more of a mental game for me now. I need to make sure my head is right and I'm not going to worry about getting injured. Now that I'm older it's a head game to see if I want to put myself through all the work it takes to get ready for a show. As I said earlier, if I do this it will be for me to prove I can do it. Before, I didn't have that issue because I competed for sponsors and other reasons. This will be all about challenging me if I do the show in December. We'll have to wait and see. So all of the talks about coming back are a little premature. Is that what you are saying? At this point, yeah it is. My back is coming along pretty good compared to where it was. I couldn't even take five steps before without hurting. Now I can walk a mile no problem. You know what I mean? So if you decide you are mentally ready to prepare for the Masters World Championships, will it be more difficult for you to prepare since you haven't done it in a few years, or will it be like riding a bike so to speak? Oh if I decide I am going to do it then the prep work will be nothing new for me and I will be able to do it without any problem. I may not be as strong as I used to be but I am still pretty strong and I know I can handle what I have to do in the gym to be ready to step on stage in Miami. The preparations don't bother me a bit. It's just a matter of deciding if I'm clear in my mind that I want to do it. Also if I do it then it'll be different because this is for me and not for endorsements or anything like that. I'm not even with BSN anymore so this will be all about me and if I can still do it. A lot of the guys in that show are older and past their prime and are probably doing it to see if they can do it too. You mentioned the work in the gym. Now that you are a few years older, will the training remain the same as it did when you were Mr. Olympia or will you change up what you do to get ready for the show? Training will be a little different. I'm 46 now, will be 47 when the show comes around, so I'm not going to be as strong as I was when I was Mr. Olympia. What I used to call "light weight" will probably feel heavier. (He laughs) I won't be able to handle all the weight like I did when I filmed the videos and did all the other things I did back a few years ago. I have to make adjustments and train a little differently, but I will still give all the effort I did back then. That part of it will never change. I still believe in training heavy and hard. It's just I can't go as heavy as I did back then. When you competed there weren't too many flaws with your physique. Now will you focus on improving any part in particular or will you just focus on bringing the best you've got? Yeah I'm past the point now of worrying about weak points. I'm just going to focus on bringing the best I've got to the stage and that's it. Back then, whatever was considered weak on my body I would take time to improve. Nowadays I don't worry about things like that. Will anyone be helping you get ready for the show or will you do the prep on your own? Again that's something I haven't given much thought to and probably won't until I decide if I'm going to do the show or not. I have a lot of experience getting ready for shows so I may end up doing my own prep work, but we'll have to wait and see before I can answer that conclusively. Have you given any thought to who else is in the lineup or are you just worrying about you? I talked to the promoter and there were actually 12 guys invited. Dexter Jackson, former Mr. Olympia is doing it. Toney Freeman, who placed high at the Olympia is doing it. Samir Bannout who was dominant in his day ('83 Mr. Olympia), Chris Cormier, who always placed high in shows is doing it. It's a good list of guys but some of them are older; even older than me. They're good though because I don't know if I could do it at their age. You can't blame them for doing it though because this show is invitation only and the purse is the 3rd highest on the entire circuit. So when do you think you will make the ultimate decision to grace a bodybuilding stage with your presence? I don't know when I will make the decision. I couldn't set a date, but when I do I will let everyone know. I would like to do it, and if my head is in it then it will be on for sure.